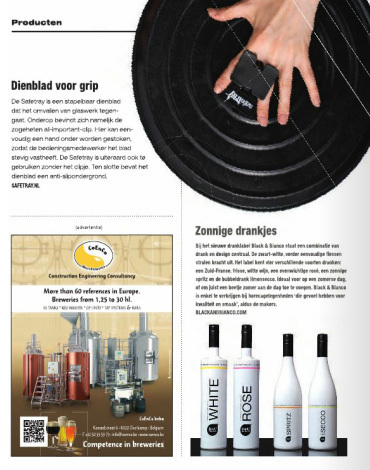 Safetray is a featured product in cool Dutch hospitality magazine Proost. Proost (which means Cheers) focuses on the cutting edge of the Dutch bar and restaurant scene, so of course Safetray is one of their favourite things. Safetray is available to buy in the Netherlands from RET Company - you can call them on +31 (0) 641 390 039 or visit their website here. Posted on September 10, 2013 by Helen Milburn and tagged safetray netherlands proost-magazine press. Safetray is up for an Accenture Innovation Award in the Netherlands. If you love Safetray as much as we do, please follow this link and share on Twitter, LinkedIn and/or Facebook. The more votes we get, the closer we get to winning a 40,000€ advertising budget for the Dutch market. "The stable and secure solution for working with a tray without it falling! Safetray is an easy, fast, durable, stackable tray with built-in protection against the tipping of glassware. This is to avoid the danger and the costs that go along with a full tray falling." Posted on July 24, 2013 by Helen Milburn and tagged awards netherlands. 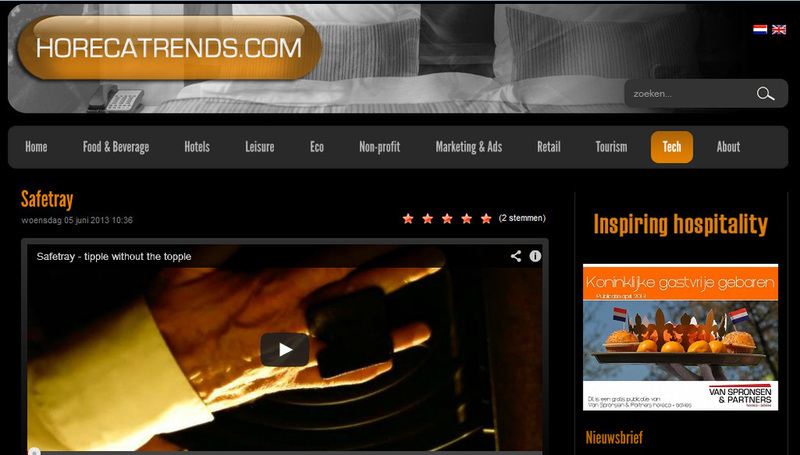 Safetray has received a five star review from Netherlands hospitality site Horeca Trends. "Sometimes a server in a restaurant drops a tray accidentally and knocks over all the drinks. With the 'Safetray' this will not happen again soon. There is an 'All-important clip' placed under the 'Safetray' which will easily support your fingers, so the tray will be much more stable. A useful gadget for restaurants!" "I ordered several online because we work a lot with new catering staff. Positive reactions and we have seen a reduced number of wasted drinks only one month after purchase!" Posted on June 5, 2013 by Helen Milburn and tagged news netherlands testimonial review press.